Beriberi in an adult patient. Cassava is a staple in many developing countries and has been used in a variety of high-energy diets. Although it contains thiamine (0.05-0.225 mg of thiamine per 100 g of cassava, depending on the crop), the high carbohydrate load of a diet rich in cassava actually consumes more thiamine than it offers the body. This can produce a thiamine deficiency through the same mechanism observed when dextrose is administered to a person with limited supplies of the vitamin. Include education regarding Korsakoff syndrome (which arises from thiamine deficiency) for patients being treated for alcohol dependency, one of the causes of thiamine deficiency. As with any substance abuse treatment program, education needs to be combined with a serious, multidisciplinary team approach to have any chance of success. With other causes of beriberi, once the primary problem has been addressed, an appropriate diet providing more-than-adequate thiamine levels should be adopted by the patient. For practical reasons, replacing thiamine as an initial test may be most feasible. If the patient responds to treatment, it is safe to assume that a measure of thiamine deficiency was responsible for the condition. In conjunction with whole blood or erythrocyte transketolase activity preloading and postloading, a thiamine loading test is the best indicator of thiamine deficiency. An increase of more than 15% in enzyme activity is a definitive marker of deficiency. However, this test is expensive and time consuming; it is performed only for criterion-standard proof of deficiency. Measure urinary methylglyoxal; also measure serum thyroid-stimulating hormone (TSH), to rule out thyrotoxicosis-induced high-output heart failure, if applicable. In suspected cases of thiamine deficiency, prompt administration of parenteral thiamine is indicated. The recommended dose is 50 mg given intramuscularly for several days. The duration of therapy depends on the symptoms, and therapy is indicated until all symptoms have disappeared. Maintenance is recommended at 2.5-5 mg per day orally unless a malabsorption syndrome is suspected. Most outpatient care is targeted at delivering thiamine in a bioavailable form to rehabilitated patients. Clinical follow-up with measurement of thiamine diphosphate activity may be warranted if relapse or noncompliance is suspected. When healthy individuals are deprived of thiamine, thiamine stores are depleted within 1 month. However, within a week after thiamine intake stops, healthy people develop a resting tachycardia, weakness, and decreased deep tendon reflexes; some people develop a peripheral neuropathy. Thiamine deficiency with nervous system involvement is termed dry beriberi. This presentation usually occurs when poor caloric intake and relative physical inactivity are present. The neurologic findings can be peripheral neuropathy characterized by symmetrical impairment of sensory, motor, and reflex functions of the extremities, especially in the distal lower limbs. Histologic analysis has shown that the lesions arise from a degeneration of the myelin in the muscular sheaths without inflammation. Another presentation of neurologic involvement is Wernicke encephalopathy,  in which an orderly sequence of symptoms occurs, including vomiting, horizontal nystagmus, palsies of the eye movements, fever, ataxia, and progressive mental impairment leading to Korsakoff syndrome. [13, 14, 15, 16] Improvement can be achieved at any stage by the addition of thiamine, unless the patient is in frank Korsakoff syndrome. Only half of the patients treated at this stage recover significantly. Wet beriberi is the term used for thiamine deficiency with cardiovascular involvement. The chronic form of wet beriberi consists of 3 stages. In the first stage, peripheral vasodilation occurs, leading to a high cardiac output state. This leads to salt and water retention mediated through the renin-angiotensin-aldosterone system in the kidneys. As the vasodilation progresses, the kidneys detect a relative loss of volume and respond by conserving salt. With the salt retention, fluid is also absorbed into the circulatory system. The resulting fluid overload leads to edema of the dependent extremities. By the time significant edema occurs, the heart has been exposed to a severely high workload in order to pump the required cardiac output needed to satisfy end organ requirements. Parts of the heart muscle undergo overuse injury, which results in the physical symptoms of tachycardia, edema, and high arterial and venous pressures. These changes can lead to myocardial injury, expressed as chest pain. A more rapid form of wet beriberi is termed acute fulminant cardiovascular beriberi, or Shoshin beriberi. The predominant injury is to the heart, and rapid deterioration follows the inability of the heart muscle to satisfy the body's demands because of its own injury. In this case, edema may not be present. Instead, cyanosis of the hands and feet, tachycardia, distended neck veins, restlessness, and anxiety occur. Treatment with thiamine causes low-output cardiac failure, because systemic vasoconstriction is reinstated before the heart muscle recovers. Support of heart function is an added requirement at this stage, and recovery is usually fairly quick and complete if treatment is initiated promptly. However, if no treatment is available, death occurs just as rapidly (within hours or days). Loss of thiamine through renal excretion can occur with most, if not all, diuretics. It has been seen with the use of such diuretics as mannitol, acetazolamide, chlorothiazide, amiloride, and loop diuretics. Thiamine loss is associated with the increase in urine flow rate, but it is not related to sodium excretion. This suggests that patients with polyuria, even if the condition is unrelated to diuretics, may benefit from thiamine supplementation. Repletion of thiamine in patients with CHF has been shown to improve left ventricular function. In a study of 59 superobese patients who underwent bariatric weight-loss surgery, Aasheim et al concluded that the risk of thiamine deficiency in the first months following a duodenal switch procedure may be higher than it is after a gastric bypass, while the risk of vitamin A and D deficiencies following duodenal switch surgery may be greater in the first year than it is after gastric bypass. The investigators compared the vitamin status of individuals who underwent laparoscopic Roux-en-Y gastric bypass to that of patients in whom laparoscopic biliopancreatic diversion with duodenal switch was performed. The investigators found that following surgery, a steeper drop in thiamine levels occurred in the duodenal switch patients than in the patients who underwent gastric bypass. In addition, mean concentrations of vitamin A and 25-hydroxyvitamin D were lower in the duodenal switch group. Follow-up examinations were conducted at 6 weeks, 6 months, and 1 year after surgery. Thiamine serves as a coenzyme (in the form of thiamine pyrophosphate) in a variety of metabolic processes. In these processes, thiamine pyrophosphate is regenerated via the donation of a proton from the reduced form of nicotinamide adenine dinucleotide (NADH). Folic acid is essential to having enough dihydrofolate reductase to regenerate NADH from its oxidative form. This regeneration allows NADH to continue to be present to regenerate thiamine pyrophosphate without being consumed in the process. If folic acid is deficient in cells, it causes an indirect thiamine deficiency, because thiamine is present but cannot be activated. 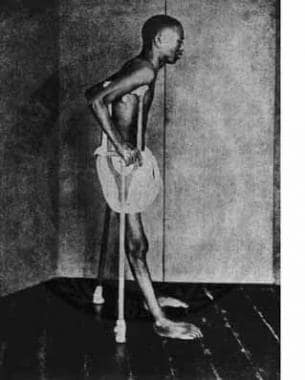 Beriberi is observed in developed nations in persons with alcoholism, people on fad diets, persons on long-term peritoneal dialysis without thiamine replacement, persons undergoing long-term starvation, or persons receiving intravenous fluids with high glucose concentration. No accurate statistics are available on the incidence of this condition. Developing countries are known to have more vitamin deficiency problems in general, but there has been a lack of accurate statistics for thiamine deficiency. Beriberi has been reported among refugees who are relying on emergency food aid. This is due to the lack of available micronutrition supplementation. Beriberi can be quickly fatal or can slowly rob an individual of almost all energy for even the simplest of daily activities. However, it is one of the most easily treatable conditions, with a remarkable recovery being possible even in severe cases. Thus, the patient prognosis for beriberi is usually good, unless patients have established Korsakoff syndrome. When patients have progressed to this stage, the degree of damage is only minimally reversible. In cases of wet beriberi, clinical improvement can be observed within 12 hours of treatment, with normalization of heart function and size occurring in 1 or 2 days. The recovery is so dramatic that treatment with thiamine is a diagnostic test, which can be used in cases of acute heart failure and insidious peripheral neuropathy. Wooley, JA. Characteristics of thiamin and its relevance to the management of heart failure. Nutr Clin Pract. Oct-Nov 2008. 23:487-93. [Medline]. Isselbacher KJ, Braunwald E, Wilson JD. Harrison's Principles of Internal Medicine. 13th ed. New York, NY: McGraw-Hill; 1994. 474-475. McCormick DB. Shils ME, Young VR, eds. Modern Nutrition in Health and Disease. Philadelphia, Pa: Lea and Febiger; 1988. 355-61. Rosen P, Barkin R. Emergency Medicine: Concepts and Clinical Practice. 4th ed. St. Louis, Mo: Mosby Year Book; 1998. 2138-40. Thiamine. Monograph. Altern Med Rev. 2003 Feb. 8(1):59-62. [Medline]. Beers MH, Berkow R, Bogin RM, eds. The Merck Manual. 17th ed. Whitehouse Station, NJ: Merck & Co; 1999. 45-6. Cole PD, Kamen BA. "Beriberi" interesting!. J Pediatr Hematol Oncol. 2003 Dec. 25(12):924-6. [Medline]. National Academy of Sciences. Dietary Guidance: Dietary Reference Intake Reports. USDA National Agricultural Library. Available at http://fnic.nal.usda.gov/nal_display/index.php?info_center=4&tax_level=3&tax_subject=256&topic_id=1342&level3_id=5141. The National Academies Press. Nutrition - Dietary Reference Intakes: DRIs): Recommended Dietary Allowances and Adequate Intakes, Vitamins. Available at http://iom.edu/Activities/Nutrition/SummaryDRIs/~/media/Files/Activity Files/Nutrition/DRIs/RDA and AIs_Vitamin and Elements.pdf. Accessed: July 27, 2011. Lu J, Frank EL. Rapid HPLC measurement of thiamine and its phosphate esters in whole blood. Clin Chem. 2008 May. 54(5):901-6. [Medline]. Karuppagounder SS, Xu H, Pechman D, et al. Translocation of amyloid precursor protein C-terminal fragment(s) to the nucleus precedes neuronal death due to thiamine deficiency-induced mild impairment of oxidative metabolism. Neurochem Res. 2008 Mar 4. [Medline]. Vasan S, Dulebohn SC. Wernicke Encephalopathy. 2018 Jan. [Medline]. [Full Text]. Indraccolo U, Gentile G, Pomili G, et al. Thiamine deficiency and beriberi features in a patient with hyperemesis gravidarum. Nutrition. 2005 Sep. 21(9):967-8. [Medline]. Zuccoli G, Gallucci M, Capellades J, et al. Wernicke encephalopathy: MR findings at clinical presentation in twenty-six alcoholic and nonalcoholic patients. AJNR Am J Neuroradiol. 2007 Aug. 28(7):1328-31. [Medline]. Hazell AS. Astrocytes are a major target in thiamine deficiency and Wernicke's encephalopathy. Neurochem Int. 2009 Jul-Aug. 55(1-3):129-35. [Medline]. Zuccoli G, Pipitone N. Neuroimaging findings in acute Wernicke's encephalopathy: review of the literature. AJR Am J Roentgenol. 2009 Feb. 192(2):501-8. [Medline]. Masumoto K, Esumi G, Teshiba R, et al. Need for thiamine in peripheral parenteral nutrition after abdominal surgery in children. JPEN J Parenter Enteral Nutr. 2009 Jul-Aug. 33(4):417-22. [Medline]. Matrana MR, Davis WE. Vitamin deficiency after gastric bypass surgery: a review. South Med J. October/ 2009. 102:1025-31. [Medline]. Ahmed A, Daida Y, Novotny R. PS2-02: Micronutrient Deficiencies After Bariatric Surgery: Does Ethnicity Matter?. Clin Med Res. 2011 Nov. 9(3-4):165. [Medline]. Francini-Pesenti F, Brocadello F, Manara R, Santelli L, Laroni A, Caregaro L. Wernicke's syndrome during parenteral feeding: not an unusual complication. Nutrition. February 2009. 25:142-6. [Medline]. Braverman LE, Utiger RD. Werner and Ingbar's The Thyroid: A Fundamental and Clinical Text. 7th ed. Baltimore, Md: Lippincott Williams & Wilkins; 1996. 694, 864. Sriram K, Manzanares W, Joseph K. Thiamine in nutrition therapy. Nutr Clin Pract. 2012 Feb. 27(1):41-50. [Medline]. Al-Attas OS, Al-Daghri NM, Alfadda A, Abd Al-Rahman SH, Sabico S. Blood Thiamine and Derivatives as measured by High-Performance Liquid Chromatography: Levels and Associations in DM Patients with Varying Degrees of Microalbuminuria. J Endocrinol Invest. 2011 Nov 22. [Medline]. Wiesen P, Van Overmeire L, Delanaye P, Dubois B, Preiser JC. Nutrition disorders during acute renal failure and renal replacement therapy. J Parenter Enteral Nutr. March 2011. 35:217-22. [Medline]. Sica DA. Loop diuretic therapy, thiamine balance, and heart failure. Congest Heart Fail. 2007 Jul-Aug. 13(4):244-7. [Medline]. Hanninen SA, Darling PB, Sole MJ, et al. The prevalence of thiamin deficiency in hospitalized patients with congestive heart failure. J Am Coll Cardiol. 2006 Jan 17. 47(2):354-61. [Medline]. Aasheim ET, Bjorkman S, Sovik TT, et al. Vitamin status after bariatric surgery: a randomized study of gastric bypass and duodenal switch. Am J Clin Nutr. 2009 Jul. 90(1):15-22. [Medline]. Rao SN, Mani S, Madap K, et al. High prevalence of infantile encephalitic beriberi with overlapping features of Leigh's disease. J Trop Pediatr. 2008 May 8. [Medline]. Fattal-Valevski A, Azouri-Fattal I, Greenstein YJ, et al. Delayed language development due to infantile thiamine deficiency. Dev Med Child Neurol. 2009 Aug. 51(8):629-34. [Medline]. Nath A, Tran T, Shope TR, Koch TR. Prevalence of clinical thiamine deficiency in individuals with medically complicated obesity. Nutr Res. 2017 Jan. 37:29-36. [Medline]. Weise Prinzo Z, de Benoist B. Meeting the challenges of micronutrient deficiencies in emergency-affected populations. Proc Nutr Soc. 2002 May. 61(2):251-7. [Medline]. Whitfield KC, Smith G, Chamnan C, et al. High prevalence of thiamine (vitamin B1) deficiency in early childhood among a nationally representative sample of Cambodian women of childbearing age and their children. PLoS Negl Trop Dis. 2017 Sep. 11 (9):e0005814. [Medline]. [Full Text]. Harel Y, Zuk L, Guindy M, Nakar O, Lotan D, Fattal-Valevski A. The effect of subclinical infantile thiamine deficiency on motor function in preschool children. Matern Child Nutr. 2017 Oct. 13 (4):[Medline]. Shenoy VV, Patil PV, Nagar VS, et al. Congestive cardiac failure and anemia in a 15-year-old boy. J Postgrad Med. 2005 Jul-Sep. 51(3):225-7. [Medline]. Karaiskos I, Katsarolis I, Stefanis L. Severe dysphagia as the presenting symptom of Wernicke-Korsakoff syndrome in a non-alcoholic man. Neurol Sci. February 2008. 29:45-6. [Medline]. Isenberg-Grzeda E, Shen MJ, Alici Y, Wills J, Nelson C, Breitbart W. High rate of thiamine deficiency among inpatients with cancer referred for psychiatric consultation: results of a single site prevalence study. Psychooncology. 2016 May 26. [Medline]. Jain A, Mehta R, Al-Ani M, Hill JA, Winchester DE. Determining the Role of Thiamine Deficiency in Systolic Heart Failure: A Meta-Analysis and Systematic Review. J Card Fail. 2015 Dec. 21 (12):1000-7. [Medline]. Angstadt JD, Bodziner RA. Peripheral polyneuropathy from thiamine deficiency following laparoscopic Roux-en-Y gastric bypass. Obes Surg. 2005 Jun-Jul. 15(6):890-2. [Medline]. Koike H, Iijima M, Mori K, et al. Postgastrectomy polyneuropathy with thiamine deficiency is identical to beriberi neuropathy. Nutrition. 2004 Nov-Dec. 20(11-12):961-6. [Medline]. Edwards KA, Tu-Maung N, Cheng K, Wang B, Baeumner AJ, Kraft CE. Thiamine Assays-Advances, Challenges, and Caveats. ChemistryOpen. 2017 Apr. 6 (2):178-91. [Medline]. Tran HA. Increased troponin I in "wet" beriberi. J Clin Pathol. 2006 May. 59(5):555. [Medline]. Falder S, Silla R, Phillips M, Rea S, Gurfinkel R, Baur E, et al. Thiamine supplementation increases serum thiamine and reduces pyruvate and lactate levels in burn patients. Burns. 2010 Mar. 36(2):261-9. [Medline]. Wani NA, Qureshi UA, Ahmad K, Choh NA. Cranial Ultrasonography in Infantile Encephalitic Beriberi: A Useful First-Line Imaging Tool for Screening and Diagnosis in Suspected Cases. AJNR Am J Neuroradiol. 2016 Aug. 37 (8):1535-40. [Medline].